As mentioned, our exquisite autumn weekend had me out enjoying the warmth and sun, not to mention the birds. I was pleased to note that sharp Common Grackles hadn’t yet entirely vacated Western New York. Since they signal spring for me more accurately than wintering robins, their presence assures me that winter is still far off. Corey’s Best Bird of the Weekend was an easy decision this weekend. A Yellow-billed Cuckoo in mid-October is always a decent bird and when one decides to sit out and enjoy the autumn sun it’s a tough bird to top. 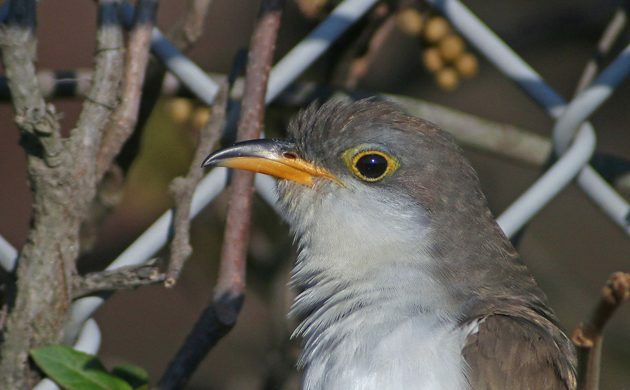 Corey loved digiscoping the sunning Yellow-billed Cuckoo above at Jacob Riis Park in Queens on Sunday morning and it was a no doubt Best Bird of the Weekend. I attended a Northern California Audubon Council meeting on Saturday on the coast in Fort Bragg. My best bird was arguably the near threatened Heermann’s Gull which can be seen in an older blog post here on 10000 Birds. I did photograph some Mew Gulls that were at Van Damme beach in Little River. I will post them here on Thursday morning! Nice cuckoo. I was hoping to find one of those migrating through Costa Rica this past weekend. No dice there but I was still happy with finally adding Spot-crowned Antvireo to my CR and year list. I stand corrected, w/r/t my BBotW of last week. One more chattering Chimney Swift crossed my path — this one over the roofdeck of the parking garage at work. So long, little friends, see you in spring! Pallas’s Warbler for me, which is minor stuff compared to the rush of Siberian passerines which have turned up on the east coast of Britain in the last few weeks, and over Europe as a whole. I didn’t see my best bird of the year, but I did hear my first Shining Cuckoo of the season this weekend. Spring is here! Best bird of the weekend even! I was excited to not only see, but get to photograph a pair of Gilded Flickers this weekend! And Mike, since my football team is having a “rebuilding” year, it good to know that some one is having fun watching football this year! Finally, A Honduras Wrap-Up Post! Where Are You Birding This Second Weekend of June 2016?